Rather than following unsolicited advice, landowners should talk with a professional forester of their choosing before planning any timber harvest including the possible harvest of high-value black walnut trees. The "Ohio Call Before You Cut" is a great resource ((877) 424-8288). See "More Information" below for the website. As is common with bark beetles, WTB attacks its host's stems in multiple locations with the females boring through the bark and tunneling through the phloem. The Gm fungus carried by the beetles infects the surrounding phloem tissue producing small circular to oblong shaped dark brown cankers in the phloem tissue. TCD is so-named because of the collective impact of multiple cankers: "death by a thousand cuts" becomes death by a thousand cankers. Despite its common name, WTB actually targets branches that are greater than 1/2" in diameter. They will also tunnel into the main stems. The adult and larval tunneling and feeding activity produce symptoms typical of bark beetles with frass-filled galleries meandering through the phloem. Of course, black walnuts trees aren't out of the woods yet. Even though beetle trap catches are low, they aren't zero. There is always a chance beetle populations could rebound which is why Butler County, OH, remains quarantined. 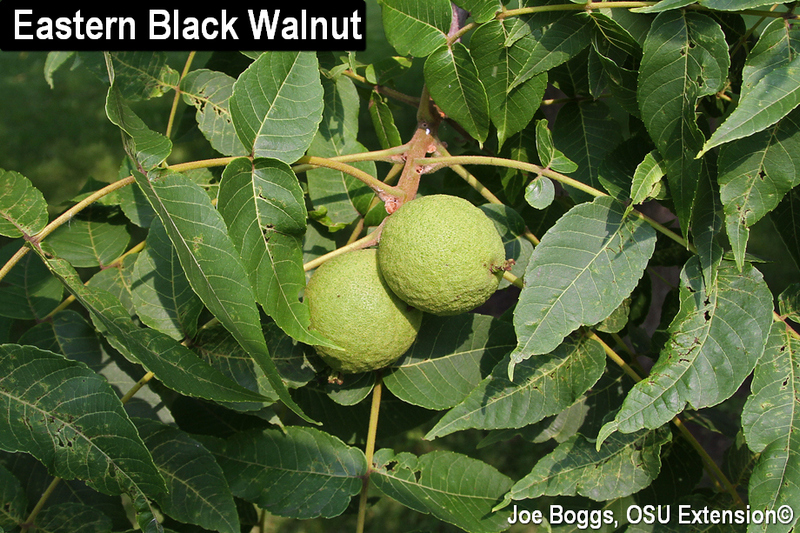 Movement of walnut trees as well as wood products such as logs cannot be moved outside of the county within Ohio, or outside of the state, without conforming to quarantine restrictions. For details, contact the Ohio Department of Agriculture (ODA). However, don't rely entirely on the images I've provided in this report to eliminate TCD from a diagnosis. If you suspect TCD is affecting a walnut tree, you should contact our ODA. It's always better to report a suspected occurrence of TCD even if it turns out not to be rather than to ignore an actual TCD site out of fear of being wrong. Remember that TCD in Ohio was originally discovered thanks to an alert landowner contacting our ODA!